In this episode, Reina and Christina are joined with Bonnie Christine. Bonnie Christine is a successful service pattern designer and to date has taught over 50,000 students the art of surface design. She's excited to be launching an all new course, "Surface Pattern Design Immersion". 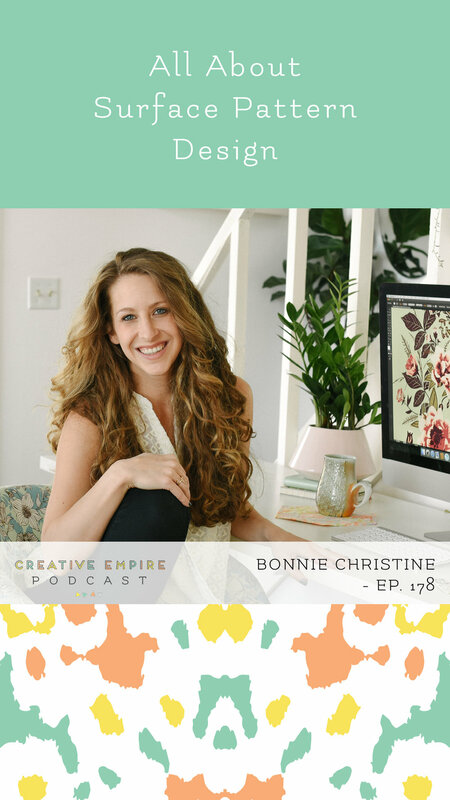 At the beginning of the episode, Bonnie shares about what surface pattern design is and how her new course will teach students the ins and outs of how to become a licensing artist. After that, she shares about the skill needed to become a designer and what has been happening in the industry since she was last on the podcast. Lastly, she shares how residual income has transformed her businesses and all about the new course she has created. Take a listen below! Sophisticated and delicate, Bonnie Christine’s designs transcend time and brighten up the past. Bonnie weaves a small part of her life into each pattern she creates, making the design process and end results meaningful and unique. She lives nestled back in the forests of North Carolina where she finds endless inspiration from the mountains around her. Stay connected with her through her blog, Going Home to Roost and attend one of her classes on surface pattern design on either CreativeLive or Skillshare.